boost the number of characters allowed! I bumped it up from 300 to 450. I'll stick to the five lines, but I'll enjoy including more BBCode! Well.... centering is a paragraph based tag, not a character-based one.... you can "bold" or "italicize" a single character.... to "center" you have to do it to the whole paragraph. And this affects things how? So you add paragraph centering ... again, all the other forum softwares allow it, so it can't be that hard. If they can manage to put in the list-type formatting, centering would be a piece of cake! Oh well, I love the folks at this forum, but I still prefer the YaBB forum software. Though it will take a while, we have a whole laundry list of modifications to install. And I do hope you realise my gripe there was with phpBB, not with you or Brf! Joe, I know you said there would be a "feature it" area where we could ask for mods we'd like to see here. I'm thinking that this must be it? If not, pardon my interruption! I personally would like to have a calendar mod!!!! Just where are we going, and why am I in this handbasket??? Can you get it to happen in Fire... Never mind. I had to force it by using Innernet Exploder, first, but now the icon shows on Firefox. Firefox and IExplore will both find it eventually, after enough Refreshes. it's there on mine. as for mods, I'll leave that up to others, though a money mod may work, esp. as I know it is possible to set them based on how long a post is, which encourages good posts, not spam. I added a new entry on the lefthand menu. The TWG Status page will open in a new window. I noted the addy icon yesterday. TWG status link was a good idea too. Considering we should be getting more traffic from people googling TWG then it can't hurt adding features that support the game. WHEEEEE! Now, how about doing the same to the PM page? It annoys me that when I click on it, I lose the page I was working on, I've lost a bunch of posts that way. Oh. You want the PM page in a new window? That is easy. /me is a happy kitty. I don't want to be the bearer of bad news, you're not going to recieve any traffic from people using Google. If you are hoping for this then you really have to work at optimising the site to gain a good rank for the search phrase "the werewolf game", with particular reference to the "home" page which does nothing to promote the site to google at all at the moment. You also need to consider the way the forum itself is set up to make it accessible to Google. Most importantly you also need to begin to build up a library of sites linking to here. However, links are not enough on their own - the text of the link is very important. Ideally, you want all the links to your site to contain the text people will be searching for. 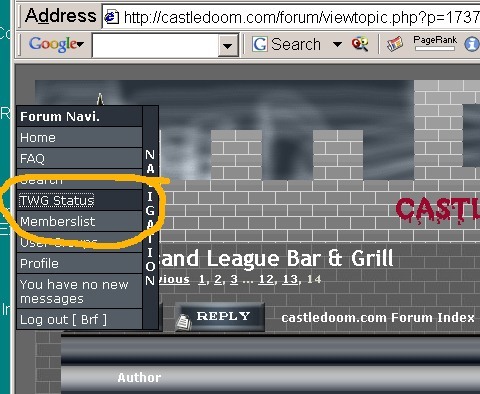 In other words, links saying "castledoom.com" are useless, unless you think people will search for that phrase! - you need everyone to link using the text "the werewolf game". Google, amongst other things, judges how important a site is by how many other sites there are linking to it, and rates the importance of those links by how important it judges the site that has the link to be. Getting a good rank in Google is hard work - but ultimately worth the effort. Actually that is not true for the search engine itself, since search engines use the metadata which is invisible to the casual browser. Our homepage was changed a few days ago, so it might take a few days before the new page is indexed properly. Brf, have yourself a read and do some research before dismissing someone trying to give you some helpful advice. There are plenty of resources out there to help webmasters understand how Google (and other search engines) works. I understand your comment about the metatags but their importance has been largely superceeded by technological advances. Well... I have more years than that, but not much is web-based. I will check out those sites you mention.